Low valuations and new growth opportunities are leading Apple, Broadcom and TSMC investors to take a spate of bad news in stride. Apple (AAPL - Get Report) , Broadcom (AVGO - Get Report) and Taiwan Semiconductor's (TSM - Get Report) shares are having bad days, but not as bad as one might have expected given the news that has come out since Thursday afternoon. Reasonable valuations have something to do with that. But so does a diversifying set of growth drivers that make all three companies less dependent on iPhone volumes for revenue growth than they once were. Japan's Nikkei reported overnight that Apple has told suppliers it expects to place orders for 80 millions units of the three new iPhones it's launching later this year (according to multiple reports, they consist of 5.8-inch and 6.5-inch, OLED-based, iPhone X successors, along with a cheaper, 6.1-inch, LCD-based iPhone). That compares with expected orders for 100 million iPhone 8, 8-Plus and X units at this time a year ago. The Nikkei also reported that while the new OLED iPhones will enter production in July, the new LCD iPhone won't do so until August due to component yield issues. Shortly before the Nikkei's report, Broadcom, whose mobile chip sales depend heavily on Apple, delivered a mixed April quarter report. The company reported April quarter revenue of $5.02 billion (up 19% annually with the help of the Brocade acquisition) and adjusted EPS of $4.88, topping consensus estimates of $5.00 billion and $4.76. But July quarter sales guidance of $5.05 billion, plus or minus $75 million, is slightly below a $5.07 billion consensus at the midpoint. In addition, Broadcom reported that its Wireless Communications segment sales (though up 13% annually) fell 41% sequentially to $1.29 billion, missing consensus by $100 million due to a larger-than-usual drop in shipments to "our North American smartphone customers" (there's only one that really matters). The company also guided on its call for Wireless revenue to be flat to slightly down sequentially in the seasonally stronger July quarter; sales to Apple are expected to rise due to the start of the 2018 iPhone ramp, but sales to Samsung are expected to drop. And as was the case during the company's March earnings call, Broadcom CEO Hock Tan was evasive when asked about the dollar value of the Broadcom silicon going into Apple's 2018 iPhones relative to the 2017 models. Past reports have indicated that Qorvo (QRVO - Get Report) will take some RF chip share from Broadcom in this year's models. On the other hand, JPMorgan recently forecast Broadcom's iPhone dollar content for non-RF products (Wi-Fi/Bluetooth chips, wireless charging, etc.) will rise 8% to 10% this year. Meanwhile, TSMC, a major chip contract manufacturer for Apple as well as several of its suppliers, reported overnight that its revenue fell 1.1% month-to-month in May to NT$81 billion ($2.7 billion), even though May has one more day than April and is a little stronger seasonally. The report arrives about two months after TSMC issued disappointing Q2 and full-year revenue guidance that was partly blamed on smartphone pressures. In spite of all this bad news, Apple, Broadcom and TSMC's shares are down just 1.2%, 2% and 1.6%, respectively, as of the time of this article. iPhone/iPad audio chip supplier Cirrus Logic (CRUS - Get Report) , which gets well over half its revenue from Apple, is having a somewhat rougher day: Its shares are down 3.2%. Low valuations are one reason why the damage isn't too bad. Apple, Broadcom and TSMC all trade for between 13 and 15 times their consensus fiscal 2019 EPS estimates. Apple looks cheaper still if one backs out the $145 billion in net cash/investments the company had at the end of March. Also: The Nikkei's report arguably isn't quite as bad as it initially looks, given that Apple's year-ago expectations for 2017 iPhone sales were inflated by hopes for a "super-cycle" that didn't quite materialize. While Apple's expectations for 2018 iPhone unit sales appear to be subdued, that doesn't mean the company is forecasting the kind of sales drop the Nikkei's numbers would suggest at first glance. 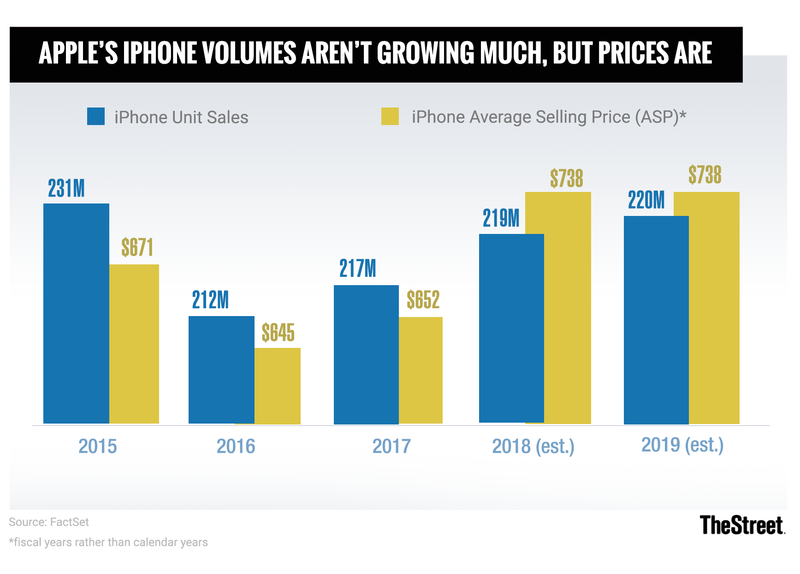 Nonetheless, it's hard to overlook how, for each company, iPhone volume growth doesn't matter to the extent that it once did. Apple is coming off a March quarter during which its iPhone unit sales only rose 3% annually, but its revenue rose 16% to $61.1 billion. That had much to do with a 31% increase in Services revenue to $9.2 billion -- this was driven by App Store, Apple Music and iCloud Storage growth, along with higher search ad revenue-sharing payments from Alphabet/Google (GOOGL - Get Report) . A 38% increase in "Other Products" revenue (driven by Apple Watch and headphone sales) to $4 billion also helped. A higher iPhone average selling price (ASP), fueled by the iPhone X and to some extent currency swings, also provided a lift. iPhone ASP rose by $73 annually to $728, helping iPhone revenue rise 14% to $38 billion in spite of just 3% unit growth. With Apple reportedly launching a 6.5-inch iPhone X successor this fall in addition to a 5.8-inch model, ASP growth might continue to help offset unit sales pressures over the next few quarters. Broadcom is seeing iPhone-related pressures partly offset by strong demand for its chips and hardware among cloud giants that are rapidly growing their capital spending. In spite of soft set-top chip and Chinese optical component demand, Broadcom's Wired Infrastructure segment saw revenue rise 22% sequentially and 9% annually last quarter to $2.3 billion, beating consensus by close to $100 million. Broadcom largely attributed this growth to cloud demand, while adding improved enterprise IT and broadband access hardware spend is also helping. Excluding the impact of the just-ended ZTE ban, Wired Infrastructure revenue is expected to rise sequentially in the July quarter. Moreover, though it might lose some RF share in this year's iPhones, Broadcom has remained upbeat that it will grow its iPhone dollar content over the long run; in March, it forecast double-digit growth over the next 3-to-5 years. The demanding RF needs of 5G RF subsystems will help, as might demand for more advanced Wi-Fi radios. TSMC, for its part, is still guiding for 10% 2018 revenue growth in spite of its iPhone exposure. Healthy demand for chips used in cloud data centers, cars and IoT devices are all helping offset mobile pressures. Higher sales of gaming GPUs and cryptocurrency mining ASICs also don't hurt. Though it's not the only reason, Apple, Broadcom and TSMC's ability to keep growing is reflective of how the broader ecosystem surrounding smartphones continues to grow even as smartphone volumes sputter. Spending on everything from online ads appearing on phones, to apps and cloud services used on phones, to IoT devices that interact with phones continues to see healthy growth. One way or another, that's creating opportunities for some of the companies that have historically depended a lot on smartphone volumes to grow. Apple and Alphabet are holdings in Jim Cramer's Action Alerts PLUS member club. Want to be alerted before Jim Cramer buys or sells AAPL or GOOGL? Learn more now.